Kingfisher is not your everyday fantasy, nor is it the kind of book I usually enjoy. Blurring the lines between genres, this ethereal and strangely abstract tale should have stymied me on so many levels, so no one is more shocked than I am at how deeply it resonated with me. It shouldn’t have worked for me—and in truth, not every aspect of the story did—but I did find certain elements greatly appealing. It helped too that I went into this book with no preconceptions and absolutely no clue what to expect at all. So I was surprised to discover early on that Kingfisher appears to be a retelling of—or at least, a story with many allusions to—the quest for the Holy Grail. It occurred to me then, that in spite of the popularity of stories about King Arthur and the knights of his court, I’ve not actually read much Arthurian fantasy. That being said, it doesn’t taken an expert to see that McKillip’s take on the genre is special, wildly inventive, and atypical of many others. The beginning of the book can only be described as abrupt, introducing us to Pierce Oliver in a brief scene helping out a group of strangers with directions as they pass through his remote home town of Mistbegotten. He is immediately inspired by the men’s sophisticated bearing and mystical aura, much like how Percival in the legend was struck by the heroism of the knights after he encountered a band of them in the forest where he lived. Pierce/Percival then leaves home for a bit of soul-searching, after his mother reveals that his father is a knight in the King’s Court. As Pierce travels to the kingdom of Severluna where King Arden holds his court, the tides are changing there as well. With magic on the rise, the king has called for all his knights to gather. An artifact of immense power has been brought to his attention, believed to hold the key to restoring Severluna’s glory. When Pierce arrives, he finds everyone in the kingdom preparing for the quest to find this legendary vessel, including the priestesses of Calluna who go against the king in believing that the lost artifact is destined for something else. 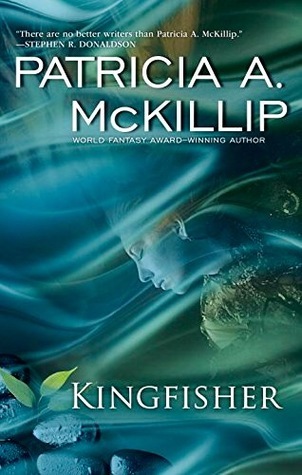 There’s almost a “magical realism” vibe to this story, though I use that description broadly; in parts, the world of Kingfisher veers so strongly into the realm of fantasy that the world can be seen as anything but natural or mundane. It should also come as no surprise that my favorite parts of this novel all had to do with the aforementioned allusions to the legends surrounding King Arthur and the Grail Quest. Retellings or so-called creative re-imaginings are always fascinating to me because of the potential for an author to take the story in a number of different directions, and here we have a somewhat offbeat mix of Medieval Fantasy meets Modern World. The source of inspiration behind Pierce Oliver’s personal journey is obvious, though there were many more references beyond that. In fact, after a while it became difficult to separate myth from reality. I had a really hard time getting a bead on the nature of the setting, which sees characters using modern technology like cellphones on the one hand, but they also don’t seem to think knights, sorceresses, or magic are anything out of the ordinary on the other. By design or otherwise, the world-building is vague and has this almost dreamlike quality, and at many points I found myself wondering if we were still playing to the Arthurian tropes or leaving them completely behind for uncharted territory. There were also moments where I felt like I was in way over my head, especially where certain characters were concerned, like Carrie’s storyline and her role in the bitter feud between Todd Stillwater and the Kingfisher Inn. And then there was the food. The mouth-wateringly, gorgeously, meticulously described food. Delicious as it all sounded, it felt incongruous and distracting, considering how everything else in the book—characters, world-building, etc.—lacked a similar level of detail. These obstacles notwithstanding, I nevertheless found a lot to like about Kingfisher, and felt myself drawn to many parts of the story. This is the first book I’ve ever read by Patricia A. McKillip, and I am glad I’ve finally gotten to experience her beautiful and expressive style for myself. Admittedly there were moments where I struggled to connect with the characters in this surreal fantasy world that she has created, but still I just can’t help but love the astonishingly unique way she has transformed the classic King Arthur mythos. I’m sure you’re not the only one! Up until this year, I couldn’t even name more than one or two of her books, I was just so clueless. Great review! I have the same feelings about this book, it was completely different to what I usually like in fantasy and it had a very dream-like feel to it. Also the description of food were mouth-watering haha. This title keeps popping up lately and I find myself intrigued at each new review. Great review! I’ve wondered about this book–and I’ve never read anything by McKillip before either. I don’t know if this is the book for me though as I don’t usually like dream-like books. They usually frustrate me and I don’t really like the Arthurian legends either. If you don’t typically do well with abstract, ethereal dreamlike books, then yeah, this book would be difficult. It’s good though, and to tell the truth, I’m not big on those kinds of books either, otherwise I would have liked this even more! I love McKillip’s work now, but the first time I read one of her books I was totally thrown. She definitely has a distinctive style. She does! I would like to explore more of her books. Maybe something that’s not so dreamlike and abstract. Ohhhh I want to read this book even more now (even though you seem a bit ambivalent about it!). I love McKillip’s style. I’ve not read this author either but I do have one of her books – The Riddle Master’s Game – now I should go and find it and move it up the list! Interesting review and a standalone too. I will go and check this one out.